Development pf antibacterials differs in several important ways from drug development in other areas, and the lack of standard dose-finding is just one of them. Dose-finding in its most basic form involves ascending amounts of drug for efficacy and safety; for antibiotics, however, an effective dose can be predicted nowadays with sufficient accuracy based on PK/PD considerations. This then becomes the dose for testing in Phase 2. 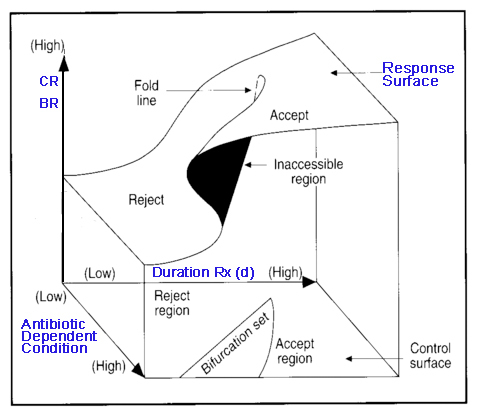 Duration of treatment is not part of the test protocol; the antibiotic is usually administered for an arbitrary number of days based on historical standards. Occasionally testing a shortened treatment regimen becomes a Phase 4 life cycle management activity. Such was the case with moxifloxacin’s sinusitis program which evaluated shorter treatment courses after the 7-day regimen was approved. These studies can provide valuable information but they rarely go far enough to define the “inflection” or “tipping point”, i.e., the minimal duration of therapy before non-inferiority becomes inferiority. For obvious reasons, few marketing departments are interested in finding out. However, others take on what antibiotic companies shy away from: clinician researchers showed for cIAI that a 4-day treatment course is sufficient , and those with a stake in PCT have studied it as a tool to shorten therapy. For nosocomial pneumonia and CABP, we now have studies demonstrating that shorter treatment does not negatively affect outcomes. While not everyone subscribes to recommendations to shorten VAP therapy as suggested by Chastre and Hedrick , the trend to shorter therapy makes sense from the standpoint of antibiotic stewardship and avoidance of unnecessary exposure or costs. But none of these trials were structured to find the ‘efficacy cliff’, none of them determined – by step-wise shortening of therapy – where the steep part of the efficacy time curve begins. In this context, failed studies become important sources of information as they help us demarcate the lower end of the efficacy spectrum. A recent publication comparing different lengths of ceftidoren treatment for uUTI reminded us of this issue, a topic which seems to get little attention . Below see some examples of drugs and indications for which treatment duration made a difference in outcomes. Please send us more examples, if you are familiar with them; we would appreciate your help in creating a more comprehensive list. Textbooks recommend a 10-day course of penicillin for streptococcal pharyngitis. Can one get well with shorter treatment? A series of studies by mainly Dutch clinicians showed rather convincingly that a 7-day course is similarly effective, but a 5-day course is not. Note that these studies were not done as parallel direct comparison trials; therefore, the data – while suggestive – still requires confirmation. A 5-day treatment course was not as efficacious as a 10-day course in toddlers aged 1-23 months in a recently published well-designed prospective trial. Just about every outcome variable was improved more in the 10-day treatment group than in the 5-day antibiotic treatment course: symptom score, severity of illness, pain, fever, bulging of the TM, and numbers of ears affected by AOM. In an old study from 1981, single high-dose cefaclor (2 g) was clearly inferior to a 10-day 250 mg TID regimen: bacterial eradication rates were 33% vs 81%, respectively . Not a short-acting drug, and often given in fairly high doses, nonetheless single one-time doses were not as effective as ≥5 day therapies according to a meta-analysis of 7 trials. What about something in-between, i.e., 3 days? In 3-day trials, the recurrence rates were worse than the longer duration regimens of 7–10 days. In a series of well-designed comparative studies of ciprofloxacin, a single high dose (500 mg) was less efficient than a lower dose regimen (100 mg BID x 3 days) or the longer 5-day or 7-day courses. While the mix of different durations and doses is confusing, the outcomes clearly favored the 3-day low dose regimen. In a direct comparison albeit open study, a 3-d vs a 7-d regimen of cefditoren in Japanese patients was equally effective, but the shorter course was associated with a lower bacteriological response rate . So, when asked whether one really “Needs to Finish All Your Antibiotics?”, the answer is YES, because <3-days for cystitis/uUTI, <7-days for streptococcal tonsillitis, and <5–10 days for AOM is associated with inferior outcomes. The answer is a big MAYBE for most other indications, but if you have study data to suggest differently, we would like to hear from you. The Efficacy vs Duration dependency remains an incompletely understood relationship. Maybe something for our PK/PD experts to weigh in on. This entry was posted in Recent Literature, The Viewpoint and tagged acute otitis media, amoxicillin-clavulanate, amoxiclav, antibiotic blog, AOM, Avelox, cefaclor, Cefditoren, cIAI, Cipro, ciprofloxacin, complicated intra-abdominal infection, cystitis, duration response relationship, efficacy - duration of therapy relationship, Harald Reinhart, moxifloxacin, PCT, penicillin, pharyngitis, PK/PD, procalcitonin test, Tipping Point for efficacy, TMP/SMX, tonsillitis, uncomplicated UTI, uUTI, VAP, ventilator-associated pneumonia by Harald. Bookmark the permalink.